In spite of what marketing would have us believe there is never one magic bullet to defend our garden against pests and disease. The things that protect our garden the most come from an arsenal of common sense tactics. They’re all simple, easy and just take a little thought. After these are in play — then we can always call in back up in the form of an organic pest control from places like Garden’s Alive and Safers. Healthy soil tops the list. The healthier your soil is the healthier your garden will be. And as you continue to improve your garden soil you’ll have far less of the fungi, blights, rots and wilts that haunt most vegetable gardens — especially those whose tenders know nothing of the importance of healthy soil. Your plants will be healthier because of it and won’t attract as many pests as plants growing in poor soil. There are lots of reasons to mulch. But mulching is also a weapon in your arsenal to help fight plant disease and pests. # 1. Mulching acts as a barrier between your plants and soil to help keep pathogens from coming in contact with your plants — especially when it rains. And your plants should be positioned and spaced so that the appropriate amount of light gets to them. It’s always good to have some dappled shade during the day, but most of your fruiting vegetables should receive about 6 to 8 hours of sun each day. Air should be able to circulate between plants so that leaves don’t remain wet long after rain-falls and dews. To draw beneficial insects to wage war on the bad guys, you need to supply them with food and water. I have perennials and herbs along the edges of my garden that bring beneficials. Although I don’t keep a container of water in the garden, my perennial plants hold water from dew in the early morning and it must be enough, because I have lots of the good guys in my garden. Keep track of what’s going on. If you catch insect pests when they first start trouble you can kill them and in most cases keep them from getting out of hand and causing a lot of damage. Watch for signs of any disease. For example: If you see the lower tomato leaves yellowing and getting spots, it’ll help to remove them and take them out of the garden and put them in the trash. It could keep the problem from spreading. I don’t usually grow broccoli and cabbage. One of the reasons is because I don’t want to deal with row covers this time of year that protect from the white butterfly that lays the eggs that turn to the cabbage worm. The majority of times, if you don’t have the row covers you’ll have the cabbage worm. Fortunately, I have had no damage on broccoli or cabbage from the cabbage worm. But I sure have seen a lot of white butterflies! In anticipation of the problem, I ordered a small container of BT from Garden’s Alive. (They call it Green Step.) If I see damage I’ll have an organic control to help me out. Another example: At least once a season in some part of the garden I’ll have a problem with slugs. I’m always ready with Escargo from Garden’s Alive. 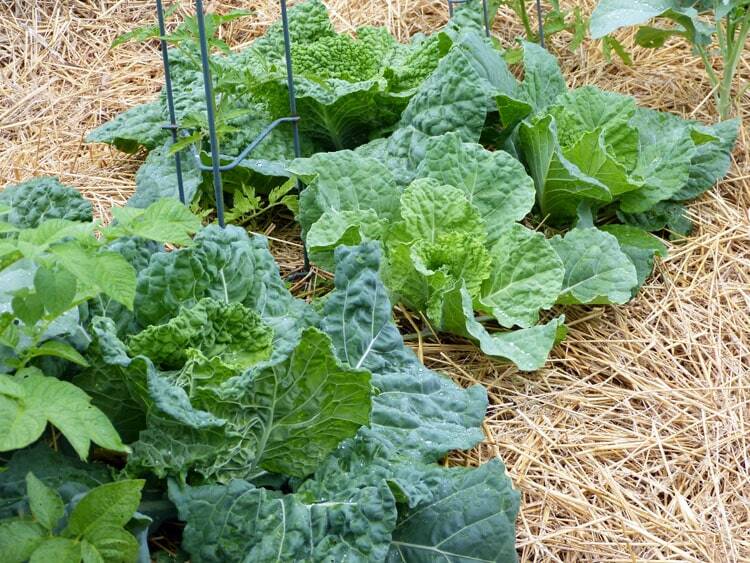 So far my cabbages show no sign of damage from the cabbage worm. Using these simple weapons continually in your garden is your overall best defense against pests and diseases. You’ll reap the reward of your efforts more with each passing year. I know I have. Organic Gardening is easy, efficient, and effective —– and it’s a lot healthier. What can you teach us about squash bug prevention? I haven’t planted my squash plants yet this year because I’m a little concerned and wondered if planting them later might help us avoid the infestation that always seems to come in mid-summer. Gayle, you must have read my mind. I’m working on a post on squash bugs. I don’t have all the answers, but I have some strategies that are definitely worth a try. I thought of not even growing squash this year, but then they’ll attack my cucumbers full force and I can’t live without my cukes. I just put my squash seedlings in 3 days ago. I’ve often read that planting late is worse than planting early. The squash bugs haven’t come out yet — so everyday without them — the plants have a chance to get stronger. Same goes for the Squash Vine Borer. I’ll try to get the post up as soon as I can. Thanks for mentioning it! I planted squash today, but with fear and trembling. The squash vine borer knows where I live and he spends the summer in my yard!! The squash bugs and the SVB have everyone house on record. At least those of us who live in the south. I have some good ideas for control coming up in a post. I finally covered my brussels sprouts with a row cover today, as I am unable to keep up with the egg production of the white cabbage butterfly. I am hoping that I was able to get all of the eggs before I covered, otherwise I’ve created a nice safe nursery for the looper babies. The pest control season is upon us. Yes, you’re right Sandra. The heat is here and with it comes “pest control season”. One well known author — who lives in the north — said if your soil is healthy you’ll have zero garden pests. Well — I hate to break it to him — but if you live in the hot and humid south — you will most likely have some type of pest in the summer before it’s over. And the SVB and the squash bug are #1 on my list! Good healthy soil and making an environment for beneficials cuts way down on the number and the damage — it’s just not 100%. I saw my first two squash bugs two days ago. Since I’d planted the squash in grow bags, it was easy to capture & kill them. I carefully searched for more bugs in the pot, using water as my helper, and found none. Then I put a ring of diatomaceous earth around the plants, built a cage over each pot and covered it securely with lightweight insect fabric. I plan to keep checking daily to see if bugs have found their way inside the barrier — so far so good. When the plants begin to flower, I know I’ll have to figure out pollination. Last year I swore I’d never grow squash again after the ravages these bugs heaped in our garden, despite daily picking of bugs and eggs, healthy soil, and a garden filled with beneficials. When the bugs finished off the squash plants, they moved to the cucumbers and melons and did them in. Hope springs eternal. Can’t wait for your upcoming post and ideas. Gayle – your are doing a great job! You’ve already covered some of the ideas I talk about in the post! I think you are on your way to being VERY SUCCESSFUL in your war against the squash bug. The bugs must be a bit early this year — unless it’s just different locations. I usually don’t see them until 3rd week in June or so. I am assuming you have a spray of water to help you get them out in the open to kill them. Diatomaceous earth has been very successful for many people and sounds like it will be for you as well. I’m still working on this post. I’ll get it done. Sorry its taking so long. Theresa, With Escargo – my slug problem seems really bad where I’ve mulched heavily – do you put it under the straw mulch or on top? I’m thinking after planting, it goes under the straw and around the plant at the base, but I’m not sure as I see the trails over top of the straw. I want to love the deep mulching, but these slugs are making it difficult. The family spent time today testing whether slugs would cross 1. pennies 2. copper tape, 3. diatomaceous earth 4. soap – and they crossed each of these multiple times with no problem!! Sandra, after planting put the escargo all around the plant at the base. Then put the straw back and sprinkles on top as well. I’ll answer this more fully in a post. You’ve brought up some good concerns and questions. I’ll try to find time today to write it. I’m sure many people share your problem and will benefit from a more detailed answer.